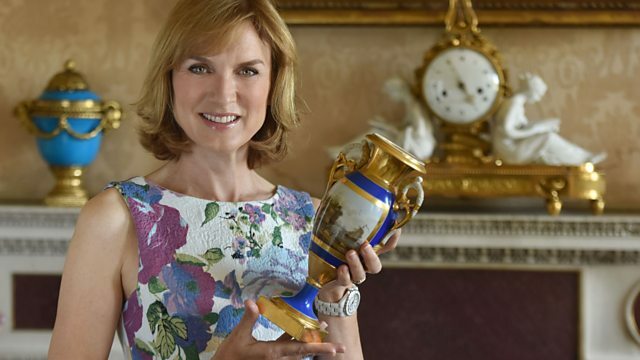 Fiona Bruce and the team return to Audley End in Essex. Items include a giant bronze cockeral and a table that was supposedly used to sign Napoleon's abdication. Browse content similar to Audley End 2. Check below for episodes and series from the same categories and more! living in this majestic house since the early 1600s. creating objects that tell vivid tales of their lives. who were considered very liberal parents in their day. slept, argued and ate, all under the supervision of their governess. This is a watercolour by one of the girls of the nursery. over there on either side of the fireplace. And it's so skilfully done. and painting interiors was hugely popular back then. and furnishings were like back in the 19th century. In the corner of these pictures is the original doll's house. of the house and life back then. is Regency and culled from trunks and boxes of the period. when I was a child and I bet our experts would be thrilled by it. English Heritage now own and cherish this lovely house and grounds. by our visitors for today's Roadshow. and this is a cracking good box. Octagonal, tooled leather, don't you think it's rather special? It looks it to me, yes. Am I going to be disappointed with what's inside? I think it's rather unusual. Let me be the judge. Have you collected it or is it a family thing? as a thank you for all his orders. That was a lovely gift, wasn't it? -So what sort of date do you reckon this is? I would think round about the 1920s, early 1920s. I'll slip it out of there. It's such a beautifully fitted case, absolutely gorgeous. -which is just after half past seven. but what a wonderful thing. which could easily be restored. Find another one and the answer is, I don't think you would. it would have been a great deal of money. It's a pretty good chunk of money today as well. I hope I'm going to surprise you. So, here we have a lovely piece of Victorian invention. so she carried it everywhere. Yes, here we see her with her five daughters. She also had four sons and as you say, holding her ear trumpet. She was obviously a wealthy lady. This is outside their house in Gravesend called Dashwood House. I don't think it exists any more. They were a family of auctioneers. Auctioneers! So they were involved in the antiques business. "inventors and only makers" and then "The Strand, London,"
so a very good piece. it has actually got this lovely grill. Did you ever think about what this was for? Well, they say it was to stop flies. do we know when she became deaf? and ever since then, Granny Cooper was deaf. I'm not sure if that would make somebody deaf. But we don't have the tube any more. That gave her great control, didn't it? So, it's mid-19th century in date. This type of bench can often be quite a conundrum. Is it a piece you've had in the family for a long time? because they inherited the furniture with the house. Exactly. When they moved out about ten years ago, it came to me. My mother calls it a Suffolk bench, my children call it the ugly bench. I really like it but I don't know what all the carving is about. Isn't it wonderful how furniture becomes part of one's life? I think that's what is so fascinating about it. but you don't necessarily know what they are. -I wouldn't call it a Suffolk bench. but what about the carvings? Are they old, are they Elizabethan? I don't know, I hoping you will tell us. the actual bench is certainly Victorian, late 19th century. It is a question of looking in detail at some of this carving. Let's start with this central figure. He is rather nice with his arms folded. A pilaster, a flat figure, with this Elizabethan costume. That is clearly a 16th century piece of carving. never ever been used in an oak bench or Settle. as to where these panels would come from. that is where you spend money on a carving. Is the central bit all one big bit of panelling? No, it has all been reframed. and nobody will be quite sure about that. -It's only worth in today's market only about £500 to £800. so you've got £1,000 worth of panelling. -That would be such a shame. -for the rest of it. and then you turn up with just the monster of all bronzes. It was at my aunt's house in Belgium where I spent my junior years. where the hell we put him. Obviously to keep it safe. and all that kind of thing. weren't they, to be used up? is not English as you can gather. and that is why we love him even more. -As long as we do well at Spurs, that's fine! but almost certainly Paris school, last quarter of the 19th century. is all about the quality and basically the size of it. It is exactly how you want to see it, this lovely nutty brown. It is just such a good-looking piece. and at auction, easily £3,000 to £5,000. -It's not a bad problem to have. So, all this stuff here is entirely the fault of the Roadshow? -"you can have one on the wall." that fitted the bill and what did that cost? -One drawing on the wall. you only had clearance for one drawing on the wall. You know what you've got, obviously? from the famous company, Robert Stephenson & Co.
-end up on an internet site? -So, you're just the buyer? They were in somebody's attic, is all I know. -But not up to 600? Let's just look back at what they are. It's the greatest name in British railway history, Robert Stephenson. which was actually to build locomotives. and so he starts with Locomotion No. 1. Of course, the most famous name is the Rocket. It wins the Rainhill Trials, it sets the pattern for locomotive building. he is selling locomotives to Egypt. It is becoming a mega, mega industrial business. is a wonderful range of designs for locomotives for various companies. This is for an Indian company, as you can see. That is for an Irish company. This one here is for the Highland Railway in 1917.
of a very important archive. There are really two values to this collection. in the 19th and early 20th century. The second value is, of course, what are they worth? Was your £100 well invested or not? -650, that makes them 15p each. Was that a good buy, do you think? do the maths. Let's take an average of £50. That wasn't bad for a punt! I'm not sure what I will do with them, really. -Put them back in the wardrobe. -Well, yes, sit on them. I found it about six years ago at a London auction house. -and came as part of the contents. -So you bought it at a really good time. Lehman Brothers had just gone down, the market crashed, money was short. You've bought a really good image by the great Edward Bawden. -whereas Audley End is a little bit further back. So, tell me what you paid for it. OK, you bought it very well. I absolutely love this artist's work. We've got a little group of letter openers and page turners here. How many of these do you actually have? tiny tip of the iceberg of your collection. Now, what got you interested in the first place? Well, this was my baby, my first baby. so any time we had off work, off we went to France. I thought, "Let's go somewhere else." well, a second honeymoon, really. Fabulous. This was the result? The thing is, you look so normal! because actually it's not to open a letter, historically. Historically, it was to open a letter when a letter was a letter. and they used a letter opener to break the seal. They used to have a seal on the letter and that was it. So, really, what we do is open envelopes, we don't open letters. And then over on the side, we have page turners. for Queen Victoria's Golden Jubilee and it's got her picture there. And I suppose the one that is most mysterious to me is this. Now, what do you know about this one? I'd like to know why that animal is trying to get hold of that lady. I don't think it is a lady, actually. I think it could be a bloke. -And who do we know that wears skirts in Europe? Well, apart from the Scots, I don't know. Ah, yeah, never thought of that. Was that a light bulb moment? Because I think that this is made of olive wood. And I'd like to think this is a dragon. of St George and the Dragon. Let anybody say that we're wrong. ..something around £600 to £700. But, you know, the thing is it is a fascinating area of collecting. a sort of late Regency tip-up table, nice mahogany top. Have you always had it? -Or did you buy it? -We bought it at auction in 2002. And I thought, "Wow, it is just a beautiful table." -Yes, when we bought it, it was very scruffy. -who did it for us. -Where does it sit in the house? It sits in a beautiful beamed sitting room. but it is just an occasional table. but it is protected by a glass top. -We had a glass top made for it. But when you opened it up and you saw that, what did you think? Well, you would think it would, wouldn't you? My French is awful, I'm afraid. "in the King's study, basically, in Chateau Fontainebleau." And you think, "Wow, that's quite something, isn't it?" "Now you've got to sign it on an English table." that they would have furnished it with English furniture. After all, they were never great mates. that this was from that event. has come off something else, or somebody has wanted to create this. but they don't go together. at the table Napoleon abdicated. So I suppose we have to come to value. to sit on because it would be a lot of money. ..it's a very nice thing. And it might be worth £1,000, £1,500, that sort of level. -But what a great story. I love furniture with stories. And I'm sorry to have to debunk it. But that's an interesting, different slant that we hadn't thought of. -So thank you for that. is that I'm always surprised. And this is exactly what happened today. What are you thinking when I'm saying that? He gave it to my mother. I don't remember her wearing it very much. and give it to my sister and me. I haven't worn it very often. I'm sort of getting the feeling that you're not so enamoured by it. when I can actually wear it. in terms of the craftsmanship. You can see through the sunlight here the piercing of the platinum. This is platinum, it's diamonds. The beautiful articulation of this brooch is quite superb. ..and it still looks superb. That is craftsmanship at its best. This would all have been hand-done. And platinum was very new to this period, 1900. It came in a French box, a retailer in Rue de la Paix. I can't find any signatures on it. I would imagine that it was made in Paris in the 1900s. which was a very used motif at the time. This is the Belle Epoque style. and in France in 1900, we call it the Belle Epoque. I mean, it is just to die for. I can't tell you what a pleasure it is to see something like this. I would imagine at auction would get about £10,000. I need to wear it more often. to keep your tea hot when it's in the pot. I'd just like to say something about this trolley. This tea trolley, which my grandmother had a very similar one. and I'm admiring the silver plate tea set you sit on the top. So I've got to ask you, do you use them? Very occasionally. We are rather tea-bag-in-mug people. I think most people are. and we use them and they do really work. which is held down, held in place by a catch. Lift the outer cover and inside we've got this inner felt lining. It's that that insulates it and keeps the liquid warm. Date-wise, we're talking mid-1930s to late 1950s. They were a very popular design. This design here was the most popular. And it was called the Heatmaster. the late 1950s. There were other names that applied to this design. that describe what they do. Just to give you a kind of general idea. And we're talking shop prices here, in a retro shop. probably £40-£50. But lovely things. Really lovely things. And they mean a great deal to you. Yes. They do. Thank you very much. gentleman. He seems to be quite a character. Where did you first come across him? and he was a grocer there in the 1740s. And became famous for becoming known as the Fat Man of Maldon. Right. So this is Edward Bright? It is Edward Bright, yes. I mean, he was the fattest man in England, wasn't he? He died in 1750, weighing 44 stones. -and he already weighed 10st 4lb. -And he was apprenticed to a grocer in Maldon. He then opened his own grocer shop. He actually fathered six children. That's unbelievable in itself, isn't it? since you found the painting. Looking at this oil painting, where did it come from? The oil painting itself, I bought at an auction. who was milliner to the Queen. And how have you found these two great prints? -belongs to the Bright family. And I've been allowed to borrow it from Bill Bright. He is a five times great-grandson of Edward. I love this print down here. It says, "The surprising bet decided." if five men resident in Maldon could fit into the waistcoat. Goodness! There is a fantastic history about this, isn't there? And what do you think about the painting? Do you think it's a, kind of, an original? Have you questioned who it's by? When I bought it at auction, it was sold as being "after Ogborne." Now, David Ogborne was a painter from Chelmsford. And research has proved that he did paint a picture of Edward Bright. is this by David Ogborne? Are we ever going to be able to prove it? Or is it just a copy? is a provincial artist copying the print after David Ogborne. And you'll see, there are differences. his weight. And on the painting, there's three. And his belly is kind of pushing his jacket open. But there's a provincial feel about the painting. the Ogborne print would have been copied a great deal. It would have been a fun thing to do. what did you pay for the oil painting a few years ago? Oh, well, you've done very well. Which was below the estimate. You've done very, very well. I'm on salads for the next month. Chinese monochromes really are quite fabulous, I think. They have this amazing, timeless nature to them. -Do you know how old these are? The best guess we've had is 19th century. Best guess is 19th century? What about you? So you all think they're old? Amazing. Cos they look so amazingly modern. They're called monochromes because they're all one colour. But two of these are porcelain, this one and this one. And these other three are more unusual cos they're made in glass. They really are lovely. I want to know how you got them. and especially quite a few Chinese things. they all have a four-character mark of the Emperor Qian Long. ..which means, "Made in the reign of Qian Long." He reigned from 1736 to 1795. So somewhat older than we thought. Yeah. They're 250 years old. And that's this, this and this. -And all three of them. and that's really nice to see that with them. they haven't got imperial marks, they're not imperial porcelains. -and so does this one. So they're the best part of 300 years old. -And these, again, look so amazingly modern. I have one or two at home. But sadly, mine are all cracked. they are quite tricky. Have you had any ideas before? but they didn't seem to be able to find anything out. Well, they are quite unusual pieces. from the ET Chow collection, and that made a fair sum. I'm going to try and do this quite quickly. These are the works of art the Chinese really want to own. These were made by imperial command. You are a very lucky girl. away from the hullabaloo of the Roadshow. How did you come by these? notably the Foreign and Commonwealth Office. She noticed these from the basement. They were being practically thrown out. but he said, "Would you like to take those home to keep them safe?" And we've had them ever since. And what do you know about him? Who is this? Hedley Nevile Fowler. Squadron Leader Hedley Nevile Fowler. as a young boy. Such a charming photograph. -And this is a painting of him. What a handsome devil he was. He was indeed, wasn't he? And what happened to him? What do you know about him? then we think the family relocated to Australia. and at the outbreak of war, he was sent to France. We know he was then shot down in May of 1940, and taken into captivity. He was held in three different camps. Colditz, that is a name to chill the heart, isn't it? It is indeed. But he actually successfully escaped from Colditz. they had the uniforms of Polish engineers. length of the castle, and walked out of the place. -And he just walked out of there? and the counterfeit key they had wouldn't fit. and in fact a sentry turned up and apologised and let them through. And what happened to him then? near Boscombe Down, which was basically as a test pilot. -..and your mum found all this stuff, just being chucked out. And how can we help you here today? Why have you brought this all to us? and I'd quite gladly give it over. they are related to him, you'd like to give this back to them? -Well, I hope it does. Squadron leader Hedley Fowler, we'd love to hear from you. but sometimes it kind of takes a turn for the dark, doesn't it? -Tell us what you've brought. and a book that he wrote about the patients, and about staff. And this is him, standing on the right. -But we should think about what it was really for. -I mean, it was for the criminally insane. Mostly murderers, attempted murderers, arsonists, that kind of thing. So it's serious, serious crime, just as it is today. Now, this looks like a photograph of a brass band. This is really not what you expect from a lunatic asylum. up to about 20 at a time. My great-great-grandfather was the leader of the band. That's him, Charles Bishop Coleman, there. It's a pretty amazing form of occupational therapy, isn't it? It is! George Stratton helped James Kelly escape from Broadmoor. it meant that he ended his days at Broadmoor. James Kelly came back 38 years later. -It's so good that he wanted to come back! Are there any stories that you find sort of particularly moving in here? Well, obviously, the escape of James Kelly is particularly interesting. I like the idea of noisy neighbours when you're trying to sleep. so that somebody could sneak back and turn them into an escape rope. that their uniform would be very noticeable outside of Broadmoor's walls. There's quite a bit of gallows humour in that book! -The commercial value is almost irrelevant. It's got such an important window into social history. so that we, you know, have it for future generations. So, my grandmother saved it all for me. So I'm very fortunate to have seen it all, really. -Well, thank you so much for bringing it. the same object. What an extraordinary collection. How on earth did you come by all these posters? My wife and I, we own a shop in Burnham-on-Crouch. doorway between, an old boarded-up doorway between the two shops. -Have you got a picture of the shop? -Yes, this is the shop. That's our original shop, here, and we bought the building next door. And there was a concealed doorway between the two. And this was just insulation, or packing, or...? It was just rolled up, scrunched up, wedged between two lots of wall. -How many are there, do you think? -In total, there's just over 100. Some are in fair condition. Some are in atrocious condition. Well, I mean, it doesn't take a genius to work out quite what's going on here. We have Wednesday August 5th 1914. It doesn't say '14, but it is '14. "Britain and Germany at war." this is the terrible news. And this must have been a day or two before, "Our ultimatum to Germany." And very quickly, the war escalates. and it was a naval war to start with. the early weeks of the First World War, in all these newspaper posters. There are stories of spies being shot, Germans being rounded up as spies. Obviously, if you were a German in the UK, you were suspicious. lovely one which says, "British tourists held as hostages." That's a bad holiday experience, that one! It's an incredibly atmospheric collection, really, isn't it? ..of the stale air was quite overwhelming. And the hairs on my arms started to prickle when I realised what it was. So what on earth are they worth? And this is the big question, isn't it? it's a bin bag full of, basically, confetti there, shredded. -Well, that's £300 to £400 there. And then the top bag are in, by and large, pretty nice condition. It's a little bit torn but it's a great one. These ones would be worth perhaps £20 or £30 each. you've got about £1,000 worth in all. Yes, very expensive and historic fish and chips. You'd think, looking at these, that we were in 18th-century Italy. They're absolutely beautiful little pictures. But, actually, we're in Ireland, aren't we? -He's known as the Irish Claude. That's right. And actually, there's a date on one of them, 1839. They're very late, because he died only two years later. -But I just thought they were completely lovely. The light in these is almost magical. -It's certainly meant to be a divine light. what does it for me. They're incredibly romantic. Is that what you saw in them when you first bought them? It was probably the romance of them that attracted me to them. I bought them initially because I liked them. the kind of pictures that you can hang anywhere in the house. Well, aren't they? And it's a lovely little pair. Impossible to understand how he's painted them, they're so clever. which actually is rather Irish, isn't it, that one? -It is, isn't it? Yes. I don't think I've seen such pretty little pictures all day. Anyway, what are we going to put on them? What did you pay for them? Well, I think they're worth about £2,000 to £3,000 now for the pair. He's a handsome brute, isn't he? Where did you get it from? It belongs to my sister. It was left to her by her deceased husband. It's been stored away for quite some time. I don't really know much about the piece. -It was bought at an auction quite a few years ago. -And you don't know how much was paid for it? -Well, I've seen a lot of silver knights of this type. I've never, ever seen one as large as this. Normally, they're half the size. This is a German one. -But I think it's a post-war copy of an earlier one. and it has this splendid sword that actually comes out of the scabbard. I mean, that's a really terrific blade and of some length. It's really a fabulous thing. the suit of armour, beautifully done. A lot of the smaller ones were made by a firm called Neresheimer in East Germany. This one is made somewhere else. The marks don't tell me where, but I love it, actually. I don't normally like these things, but this one is so beautifully made. Things like this, even though it's a copy, are quite collected. so I think it's got to be worth somewhere between £3,000 and £4,000. -I hope your sister is. -Otherwise she might use that on you! So on this glorious summer's day, you've brought me a Christmas card. Why do you have this Christmas card? What's so interesting about it? ..with Churchill's speeches. It was soon after the war, of course. these out to family and friends. a handwritten reply from the House of Commons, from Churchill. that what you've got here is a handwritten letter from Churchill. -..I'm pretty sure that it's right. ..and dated, obviously, December 1950. ..I've never seen one of these before. -And I doubt that most Churchill collectors have seen this before. It's in nice condition, it's, you know, as it was. -So, you've got two of them. And the other one's in good condition, as well? I can see them paying somewhere between £100 and £200 for it. you know, another letter, another card back at home. -You might be getting close to four figures. But it's a really nice, unusual piece of Churchilliana. -Yes! Thank you very much. I have to instantly fall in love with it, and I fell in love with this. I want to hear your story. How did you get this? Well, it belonged to my husband's grandmother. the turn of the century, so about 1920s. And whereabouts were they? They were...? Primarily in India, with the British Army. -Do you know whereabouts in India? -Well, you have mentioned a magic word there, "India". fact, we now know that it's because it is with no nitrogen in the carbon. That makes it the purest form of diamonds that you can have. the clarity, the colour and the carat weight. there's a fifth C that is equally important, and that's character. -And for stones to have character today, it's actually a rarity. is making me fall in love with it is because of the way it has been cut. It has been cut completely by hand. old-cut diamonds, but they're going to get rarer. And it's in this wonderful platinum mount. Do you enjoy wearing it? -And I wish you very well to wear it. Do you have an idea of the value at all? I think once it was suggested that it was sort of 1,000, 1,500. He'll be very pleased when I get home. exquisite craftsmanship. It's a dying art.